Hey Pauline, want to hang out? I would love to take you on a tour of my home town and its surrounds. I would love to hear how and why you have formed your views, and I would love to give you some feedback on the experiences that have formed mine. Well, it's certainly been a while. I was actually wondering if we would ever hear from you again. I was wondering if perhaps time had mellowed your views. Perhaps you had taken time to reflect. Perhaps you had made the effort to re-evaluate. I wasn't really sure what you were doing with your life, and I must be honest, I didn't really care to wonder. I briefly pondered over whether or not you had returned to the business of fish and chips. I guess, if I really stopped and wondered, I would have assumed that you had stayed in politics in some way, perhaps on a local level. Still a player, but not on the main stage. So you're back, and man, you came back with a bang. No wallflower-style, back-of-the-room lurking for you. You're here, and you want to be clear. You are definitely not afraid of the spotlight. 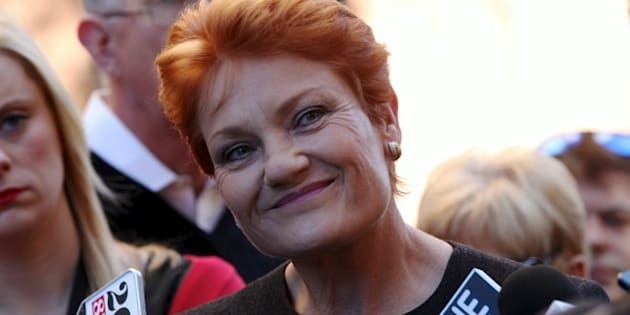 From making claims about the real victims of domestic violence, to reassuring your fans that you are still not fond of being 'swamped by Asians', you have made a comeback that John Farnham would be proud of. And not only are you playing your greatest hits, you have updated your material for a new millennial crowd. It appears that Islam, and all that it represents, is in your sights now. So concerning to you is Islam that it rates its own, very lengthy, entry on your party's website. In fact, out of 28 federal policies you have listed, two are directly related to Islam. A further three may not specifically address Islam, but allude to Islam. That's a lot of Islam. It's not like you haven't been influenced by Muslims before -- your 2000 cookbook 'Not Just Fish n Chips' appears to be dedicated to one. A Muslim dude, who influenced your life so significantly that you published a book in his memory, must have been one awesome guy. I would love to know more about him. He was obviously very important to you. It makes me wonder, though... what happened between the publishing of your book and now? I'm not sure where I will get my answers from -- judging by this article, you are not particularly enthused about giving interviews to the media. On the other hand, you do mention that you are interested in utilising citizen journalism. Now hang on a second. Pauline, I'm a citizen. Further to that, I'm a citizen who likes to write. And, I'm as about as stereotypically middle-class Caucasian Australian a citizen as you will ever find -- the kind of boring, everyday citizen you claim to be standing up for. So, Pauline, want to hang out? I would love to take you on a tour of my home town and its surrounds. I would love to hear how and why you have formed your views, and I would love to give you some feedback on the experiences that have formed mine. We could grab a coffee at my local shopping centre, Bankstown Central, in Sydney's south-western suburbs. And if you are peckish, we could head on over to my favourite kebab shop, which does one of the best mixed plates I have ever encountered. And Pauline, I'm not sure if you are much of a sweet tooth, but if I could tempt you, we could duck out for a delicious platter of Arabic sweets. It's only 20 minutes by car from Bankstown to Hurstville -- the M91 bus will take you there in 45 for $4.50 if you have an Opal card. We could kill two birds with one stone and finish our day with some dumplings in one of the several restaurants that dot Forest Road. I must admit, I don't head out that way so much these days -- I'm pretty busy with my full-time job and three small children -- but I would be prepared to make time to go with you. I know you are a hard-working mother yourself, so I am sure you appreciate how seriously I would take the opportunity... social outings with interesting adult company are few and far between these days. I hope you will take me seriously. You may not believe me, but I honestly want to hear what you have to say. I'm not going to lie, I don't agree the majority of your policies, and I don't necessarily agree with what you are reported as saying, but I am open minded, and I am definitely curious. It is in my nature to want to understand the whats and whys that make people tick. I'm funny that way. So Pauline, drop me a line. Send me a private message. Get your people to contact my people. I warn you, my people are aged seven and under, and two out of three of them have not quite grasped the concept of phone conversation. But persistence is key, and if you are patient, my daughter may stop verbally itemising her comprehensive collection of Shopkins long enough to scream: "Mum! I'm on your phone and this lady says she isn't my Nanna!" and I might actually be able to find her, and my phone, and I might even have enough time to hide in the laundry for two minutes to talk. It's unlikely, you must understand. But possible. Perhaps social media is a better option. I know it is highly unlikely, Pauline, that you will ever see this post. And even more unlikely that you would even consider taking me up on my offer. But if you don't ask, you don't get, and even though I probably won't get, I can't help but ask. Good luck, and all that. If nothing else, I think you are going to make politics a little bit more interesting.